Syrian state television said troops found chemical agents in rebel tunnels in a Damascus suburb on Saturday and some soldiers were "suffocating", intensifying a dispute over blame for a reported nerve gas attack that killed hundreds this week. The top U.N. disarmament official arrived in Damascus on Saturday to seek access for inspectors to the site of the attack and the United States was realigning naval forces in the region to give President Barack Obama the option for an armed strike on Syria. Syrian opposition accounts that between 500 and well over 1,000 civilians were killed by gas in munitions fired by forces loyal to President Bashar al-Assad, and video footage of victims' bodies, have heightened calls in the West for a robust, U.S.-led response after 2-1/2 years of international inaction on Syria's conflict. In a clear attempt to strengthen the government's denials of responsibility for the suspected chemical assault, Syrian state television said soldiers came across chemical agents in rebel tunnels in the suburb of Jobar and some were overcome by fumes. 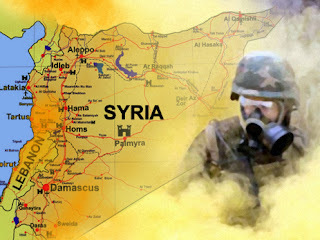 "Army heroes are entering the tunnels of the terrorists and saw chemical agents," it quoted a "news source" as saying. "In some cases, soldiers are suffocating while entering Jobar. Ambulances came to rescue the people suffocating in Jobar." An army unit was preparing to storm the insurgent-held suburb, the television added. Syrian opposition activists accuse Assad's forces of firing nerve gas projectiles into Jobar and other rebellious suburbs before dawn on Wednesday. Later in the week, activists crossed front lines around Damascus to smuggle out tissue samples from victims of the attack. The Syrian government says it would never resort to chemical weapons against Syrian citizens and in the past has accused rebels of doing so for battlefield advantage, an allegation Western leaders have dismissed. Assad's government has suggested rebels may have carried out the latest attack themselves to provoke foreign intervention. Obama has long been hesitant to intervene in Syria, wary of its position straddling faultlines of wider sectarian conflict in the Middle East, and he reiterated such reluctance on Friday. But, in a development that could raise pressure on Obama to act, American and European security sources said U.S. and allied intelligence agencies had made a preliminary assessment that chemical weapons were used by pro-Assad forces this week. Major world powers - including Russia, Assad's main ally which has long blocked U.N.-sponsored intervention against him - have urged the Syrian leader to cooperate with a U.N. inspection team that arrived on Sunday to pursue earlier allegations of chemical weapons assaults in the civil war. U.N. High Representative for Disarmament Affairs Angela Kane arrived to Damascus on Saturday to press for a Syrian government green light for inspectors to examine areas of Damascus suburbs said to have been targeted on Wednesday. Assad's government has not said whether it will give such access despite increasing pressure from the United Nations, Western and Gulf Arab countries and Russia. If confirmed, it would be the world's deadliest chemical attack in decades. Washington said on Friday it was repositioning warships in the Mediterranean, although officials cautioned that Obama had made no decision on any military move. A U.S. defence official, speaking on condition of anonymity, said the navy would expand its presence there to four destroyers from three. Secretary of Defense Chuck Hagel, en route to Asia, said Obama had asked the Pentagon for options on Syria. "The Defense Department has responsibility to provide the president with options for all contingencies," Hagel said. "And that requires positioning our forces, positioning our assets, to be able to carry out different options - whatever options the president might choose." He did not elaborate. The defence official said the USS Mahan, a destroyer armed with cruise missiles, had finished its deployment and was due to head back to its home base in Norfolk, Virginia. But, he said, the commander of the U.S. Sixth Fleet has decided to keep the ship in the region.